If you're looking for some silly entertainment without rancor and boos and, well, politics in general, step away from the tube, stream, Twitter — basically, reality — for a night and let Gilbert & Sullivan have their way with you. To be precise, The Pirates of Penzance, or, the Slave of Duty in a current run at the Skinner Barn. First of all, the Skinner is not just another renovated barn. Peter Boyton, actor/singer, proprietor and artistic director, kicked it up a notch when he transformed this classic beauty from a cow place to a people place. No doubt he was inspired by this location, on Common Road in Waitsfield, which is so lovely it almost takes your breath away. For me, a summer must-do is a picnic on the grass before the show, taking in the impossibly green and glorious landscape along with my plastic cup of rosé and takeout whatever. 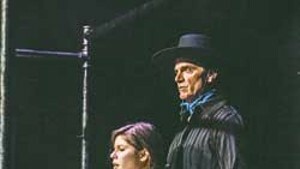 When it's time to go in for the show, I'm so chill that the Skinner Barn theater troupe would have to really blow it to ruin my mood. But, in all the years I've been attending, that's never happened. In fact, Boynton reliably assembles a crack cast, from young theater upstarts to seasoned vets of the stage, and the shows are always a delight. 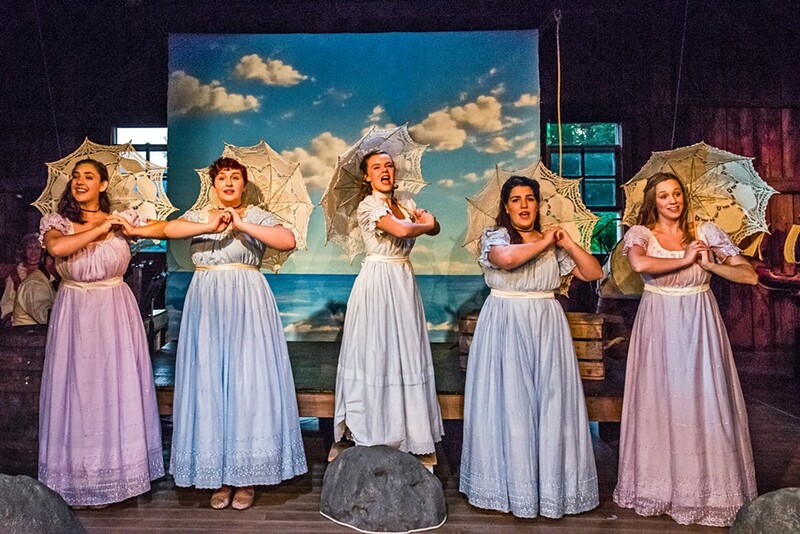 The Pirates of Penzance, which, amazingly, I'd never seen before, was no exception. And the musical invites an age and experience range, in part because of the characters themselves and in part because the plot is so ridiculous that hamming it up is pretty much de rigueur. Plot summary: Young Frederic, for some reason indentured to an unconvincing bunch of "tender-hearted" (they have an unaccountable soft spot for orphans) pirates, is about to be released on his 21st birthday. But alas, it is discovered that his birthday falls on February 29 and that, therefore, he will have to serve another 63 years. Frederic (here played with earnest haplessness and a sweet tenor by Nathaniel Miller) is charming but not the sharpest sword on the ship: He is that "slave of duty" and readily agrees to stay. This even though he has fallen in love with a local lass, Mabel, whom he spotted cavorting and singing with her many sisters during his brief moment of freedom. The daughter of a Major-General, Mabel naturally falls for Frederic in return, despite his clear lack of earning potential and inconvenient devotion to duty. Jollity, a modicum of angst, a faux-ferocious pirate capture and much singing ensue. If you also haven't managed to see this chestnut that's been around since 1879, I won't reveal the happy, I mean, the ending. So, broad-strokes acting fits right in with this show. But singing? Gilbert & Sullivan were dead serious about vocal chops. Never mind just singing well; some of the characters have to sing really well really fast, negotiating potential tongue twisters and making sure the audience doesn't lose a syllable. If G&S were alive today, they'd probably be rappers and writing hip/hip-hop musicals like, oh, Hamilton. But I digress. All of the performers pretty much nailed their singing duties on opening night. Special shout-out to two who represent that age range I just mentioned: Clarise Fearn (Mabel) and Bill Carmichael (Major-General Stanley). Fearn's soprano is agile and crystal-clear. According to the program, she just graduated from Ithaca College with a degree in musical theater and is headed to — where else? — New York City in the fall. Carmichael is a vet of Broadway shows, most recently Mamma Mia, and many in Vermont — including 14 at Saint Michael's Playhouse. As the Major-General he is simply a goofy delight. So is Mary Wheeler — a seasoned actor and musician of many Vermont stages — in the rather bizarre role of Ruth, Frederic's former nanny/guardian and would-be future love interest. Which seems inappropriate, but, hey, no more absurd than soft-hearted pirates. Best not to think too much here. 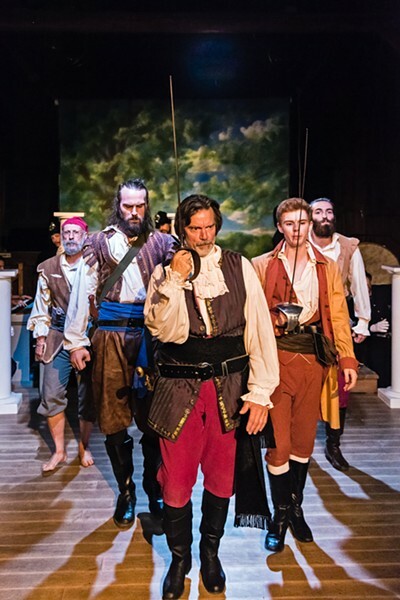 Boynton plays the pirate king with his usual relish; after a 40-year career as an actor, producer and director, the man still appears to be having the time of his life onstage. He's still in fine voice, too, which lends a teensy bit of gravitas to his comical swagger. Huge props as well to music director Jono Mainelli — a Skinner Barn mainstay — who killed it on keyboards, live onstage for the entire show. But then, this is a guy who plays with The Book of Mormon on Broadway, teaches at the NYU Tisch School of the Arts and has performed with the likes of Patti Lupone and a number of off-Broadway shows. Doing summer theater in Vermont is apparently his busman's holiday. 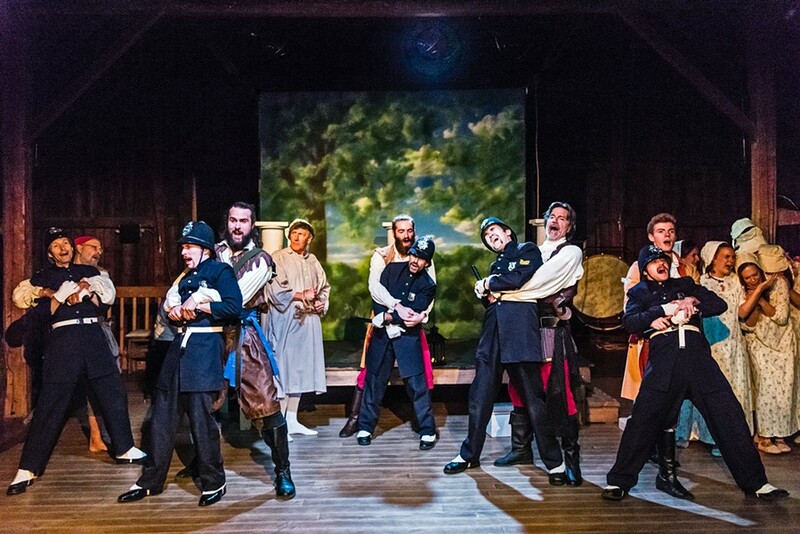 The Pirates of Penzance, by Gilbert & Sullivan, directed by Peter Boynton, continues through Sunday, July 31, 8 p.m., at the Skinner Barn in Waitsfield.